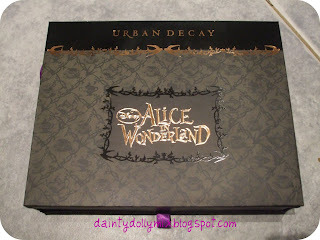 I am one of the lucky people to have the Urban Decay Alice in Wonderland Palette in the U.K.
As you may know the UK release date for this palette is the 22nd of February online at Debenhams and it will be instore at Debenhams only from the 28th February. I received my palette last week from a gorgeous lady in the US, i did a custom purchase for her before christmas and i asked if she would do the same for me so thank you so much Diane! It cost $52 which i think is equivilant to £30 ish and its going to retail for £28 in the UK. 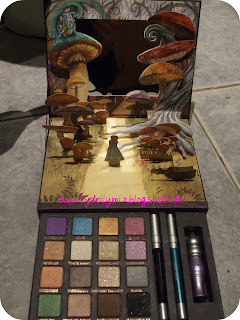 Some people have said that a few of the colours are repromotes from other palettes but as i dont own any of the Urban Decay Book of Shadows & love all things disney this palette is perfect for me! I absolutely love it, it is super quite and im glad i have had the opportunity to own this! 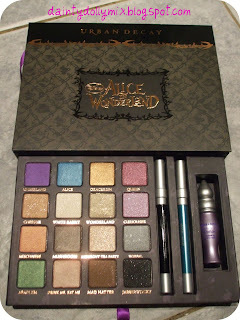 Will you be picking up the Alice in Wonderland palette or will you be giving it a miss? YES !! i will sooooo be trying to nab one of these ;-).. It's gooooorgeous! Can't wait to get this!! 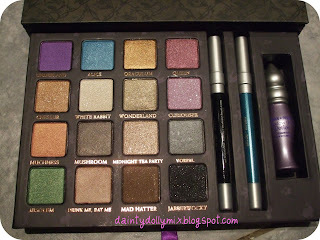 If you havent't got any other of the UD palettes, then this is a definite must-have. I have some of the colours already, but this is just too cute not to get. Ahhhhhh!!! How lucky are you doll?! :) I can't wait to get this! Posted pics of it from the US on my blog about a month ago now and have adored it since! Yay!!! I'm going to be in front of the computer on 22nd of February and Debenhams' webpage open. And I'm so gonna get it. Oh I want want WANT THIS!! How dare you show me something so beautiful when I'm meant to be saving up for my holidays! I want that so much! You are so lucky! I will be getting it :) I dont have any other of the UD book of colours either, was tempted by one recently but Im just going to wait for this beaut now! Ahhhh I need that in my life, it's beautiful!! i love it! i would love to to own this one. such a gorgeous palette! 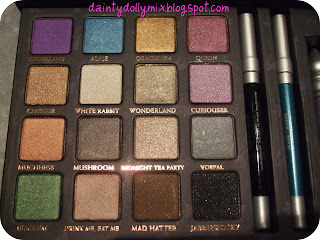 *drools away from the palette* It's gorgeous and the type of shades that I use sometimes on myself. I really am not an eye shadow girl, more of eye liner/mascara one BUT if I have a palette like this, I will definitely make use of it. I love the Curiouser, Mad Hatter, Queen and Drink Me, Eat Me. Which one is our favorite shade? i picked mine up from the us also last month! the pallette is deffo must have its so amazing!! the colours are all repromotes i think as it says on the packaging.. but its defffo a must have!! So jealous! I will be trying my hardest to get this. Even though all the shadows are repromotes i don't have any UD shadows, liners or the primer, so this seems like a good way to test them out! I want to get the palette so bad, but hubby says my 120 palette is good enough lol! MEN! anywho - I've tagged you! It's gorgeous and and I want it!! What a great palette!! Alice is simply one of my favorite movies of all time. I cannot wait for the movie release. It would be too cute to wear a look from the palette for the move opening! Oh my gosh, that may be of the prettiest thing I've ever seen. I know I wouldn't use half the colours but it's sooo lovely. Mine arrived this morning - it's as fab as sinead said!!! 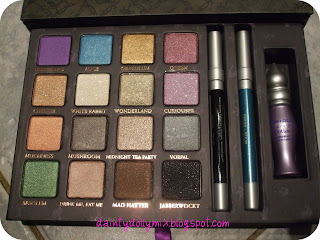 I picked mine last week (as it arrived last weeke in France) and even if I already had all the colours of this palette in others, I took it for my collection and I don't regret it !